If the presence of flow in a piping system must be monitored, a calorimetric flow switch – also known as a flow monitor – is often used. But how does a calorimetric flow switch actually work? The following blog post explains this in greater detail. Calorimetric flow switches, which are often also referred to as thermal flow monitors, use the physical laws of heat transport in flows. A distinction is basically made between two technical solutions: continuous and regulated heating. A flow switch which is based on the calorimetric measuring principle consists of a measuring probe with two temperature sensors integrated into it (see illustration). One of the sensors is heated continuously with the aid of an integrated heating element (wire-wound) with a constant heating power and measures the temperature at the heating element. 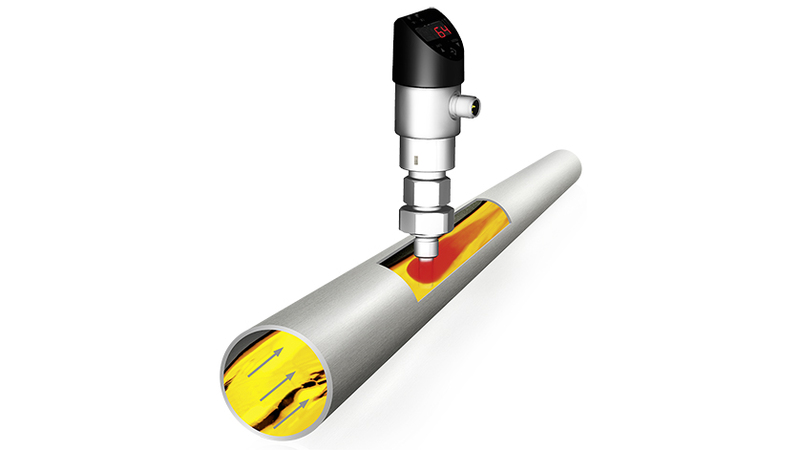 The second sensor determines the temperature of the medium in the pipe. Consequently, a temperature difference occurs between the two sensors, which is registered by the electronics. The higher the flow velocity of the medium in the pipeline, the smaller this temperature difference is. The basis for this is the cooling effect of flowing media. The molecules in the medium, which are flowing past the probe tip, collect “packages of heat” and transport them away. The more molecules flow past, the greater the cooling effect. The number of molecules passing by increases continuously with increasing flow velocity. The measuring probe is basically identical in design: There are two temperature sensors in the medium, one of which can be heated. In this technical solution, the heating power is regulated so that the temperature difference between the two temperature sensors is kept constant throughout. Consequently, as the flow velocity increases, the heating power must be increased in order to keep the size of the temperature difference constant. The applied heating power is thus a direct measure of the flow velocity in the medium. Do you have further questions on the measuring principle behind the calorimetric flow switch or do you need help with the selection of such a product? In its portfolio, WIKA has a calorimetric flow switch for monitoring the flow of liquid media (model FSD-3). Your contact person will be happy to help you.